In addition to the seasonal government hunting licenses to kill deer there is this new government plan to kill "urban deer". There will be at least 225 more deer targeted. BC "wildlife management plans" continue to create imbalances of wildlife populations. Human overpopulation, urban sprawl, destruction of wildlife habitats and other contributing factors to human/wildlife conflicts must all be taken into consideration when developing policies for human, animal and environmental protection. Concerned about the deer massacres in B.C.? In addition to the Lifeforce petitions you can send polite letters to the cities involved so far. Here is a Boycott BC Cities Killing “Urban Deer”! flyer. It can be customized for local communities. It will be updated as we fight for the freedom of these deer. Georgia Straight: Peter Hamilton: Stop killing deer for human mistakes in B.C. We the undersign support a worldwide boycott of any city in British Columbia, Canada that kill the urban deer. Shortly after February 24th Invermere started killing deer. We ask your city to implement humane, non-lethal methods to address any concerns. Will Invermere cancel your kill permit? I will boycott Invermere if you continue to kill innocent "urban deer"! 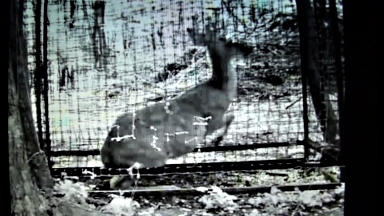 We the undersign support a worldwide boycott of any city in British Columbia, Canada that kill the urban deer. We ask your city to implement humane, non-lethal methods to address any concerns. Will Penticton cancel your kill permit? 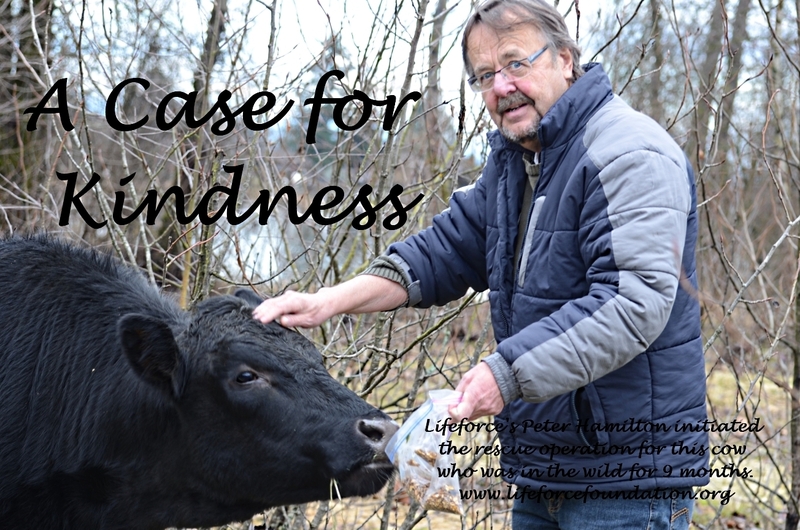 The Vancouver based ecology organization, Lifeforce, was told about the plight of an Angus cow on December 11th. We immediately contacted officials and organizations to instigate a rescue effort. In just only 10 days she was on her way to a sanctuary. In March 2011 she was on the freeway and the RCMP chased her. She ended up in a Surrey park bog and bush. This herd animal was now alone. For the next 9 months she endured coyotes, vicious dogs, harassment from humans and more threats that she only knows. This story about a very young cow who escaped the inhumane slaughter system and fought all odds by surviving for nine months in the wild near Vancouver, Canada must be told. Few others destined to be eaten have escaped and got a pass to freedom. This is cow is truly a case for kindness. A case for her freedom. She found some vegetation through to the Fall then concerned park walkers started feeding her so she would not starve to death. She was nicknamed Nellie by some and April by others. On December 19th a corral was setup and her food placed in it. As a “feral” cow who learnt how to defend herself she only let a few humans near her. During the first attempt to get her into a trailer she bolted and literally was airborne over a huge rock. So this Plan B was the next step. In the morning of the 21st the gates were closed while she was eating. She remained calm all day and did not try to knock down the temporary fencing. The CDART transport trailer came from Summerland, BC. By 5:30 she was in the trailer and on her way to a safe sanctuary for the rest of her life. Critteraid, that has a farm animal sanctuary in Summerland, BC, offered a home and their Canadian Disaster Animal Response Team provided the capture team and transport. Now settling in to her new luxury home, she spent the first night at Critteraid using the capture trailer as her home. Now called Lady Antebellum she now has a peaceful sanctuary. The Very Merry Cow “Musical” is now ready. Dana Lyons, musician and composer, gave Lifeforce permission to use his famous “Cows Have Guns” song. It will surely bring a good laugh to this good news story. From the nine months of isolation in a bush to a comfortable, safe home this cow has beaten all odds. She is doing just great. Help support a worldwide boycott of any city in British Columbia, Canada that kill the “urban” deer. We now ask Kimberley to implement humane, non-lethal methods to address any concerns. Will the City of Kimberley cancel their kill permit? Stop Kimberley Deer Kill Plan. 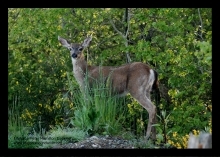 Stop Invermere Deer Kill Plan. 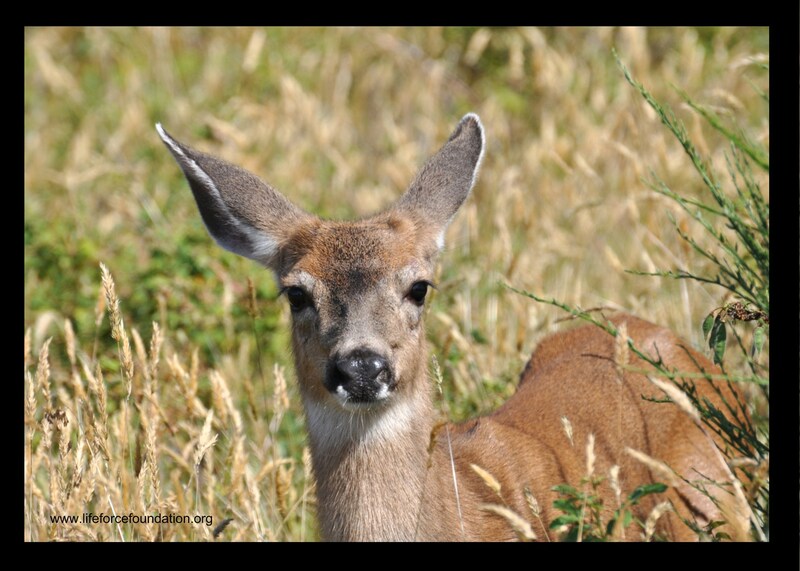 Stop Grand Forks Deer Kill Plan. Here is a sample video of a new Lifeforce “War Memorial” Project to raise public awareness of and respect for all animals who are exploited for military purposes. We thought it would be appropriate to tell you about it because there is a new feature movie called "War Horse" to be released at theatres on December 25th. Military animals are sentient creatures that are used in warfare. They are used as working animals to aid in combat related applications or weaponized (such as bombs are attached to them). Dogs, pigs, oxen, camels and horses are used for gruelling hardships such as transport, human protection, and bomb detection. Throughout history, elephants, killer whales, belugas, pigeons and rats were also used during wartimes. Dolphins, sea lions, sharks are in active use now. In WW1 a million horses died on the British side and an overall figure of 10 million horse deaths on all sides. Of the million horses that were sent abroad from the UK, only 62,000 returned, the rest dying in the war or slaughtered in France for meat. Not a great "Thank you" for saving countless human lives! In scientifically, inhumane military experiments they are poisoned, shot, burned, wounded, shocked and much more. They have no rights! Please remember all life who suffered and those who continue to be exploited as they "serve”, die and are experimented on in military experiments. The photo of the monkey is "Martha" who Lifeforce's Peter Hamilton discovered in a military research laboratory. She had been subjected to experiments and was scheduled to be blinded by a laser weapon. Lifeforce stopped that plan. Donate to our War Memorial Project in Remembrance For All Life Who Suffer! Please remember all life who suffered and those who continue to be exploited as they "serve", die and are experimented on in military experiments. “Tiqa” who was born in 2008 has died today. 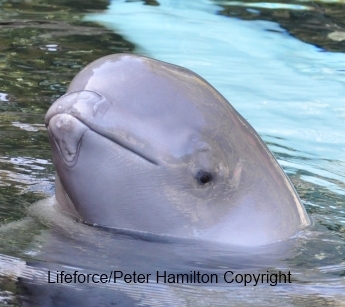 This is the 37th known dolphin death resulting from the Aquarium’s captivity policies. Lifeforce has been opposing the City of Vancouver's planned issuance of a Development Permit for a newly proposed Vancouver Aquarium expansion. The Parks Board failed to hold public meetings claiming that the new expansion is similar to the previous one approved in 2006. That one failed to get enough government funding. In addition to more dolphins in captivity, plans include river otters and beavers. The public had said no to a zoo in Stanley Park that would have had such prisons! And there is now a live cam project to show the free living beavers in Stanley Park's Beaver Lake. People can enjoy the diversity of wildlife found living freely in the park without animal prisons! Cetaceans and other wildlife suffer physically and psychologically because their social and behaviour needs cannot be provided for in captivity. They can develop painful ulcers from the stress and, in most cases, die prematurely. The Parks Board has rescinded promises to let the public vote! See Let Stanley Park Be! 3. Video "Belugas: Far From Home"
It was last April 21st and April 23rd when the horrific mass slaughter of 100 sled dogs took place. There are many events planned in hope of justice for the victims. Unfortunately, it appears that many of the Facebook groups and others are attempting to profit financially. It is also evident that the sled dog industries infiltrated and manipulated those who want a ban. Many of these self-proclaimed Whistler 100 “protectors” do not want a ban and fail to understand why the inherent dog abuses cannot be eliminated through regulations and guidelines. The government formed a Professional Mushers Association of BC and now released a useless Code of Conduct that will be hard to enforce! And the Code still permits chaining on 5’ chains that cause physical and psychological abuses. 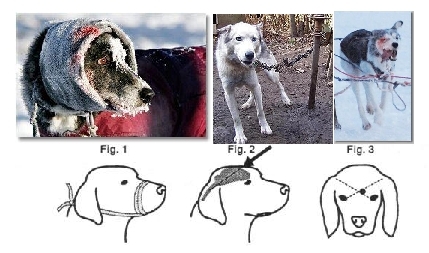 It even gives instructions as to how to use gunshot for killing dogs in spite of the “Whistler 100 Sled Dogs” shootings resulting in barbaric, long term suffering. It is shameful of the Provincial Government to use taxpayers’ money to perpetuate an inherently cruel and barbaric sled dog industry. It was evident from the beginning of the review of one mass sled dog slaughter that the Task Force goal was to defend a horrid business in BC Tourism. Terry Lake would not even allow a moment of silence for the slaughtered Whistler dogs. Why? It was they who suffered for this abusive industry to be exposed! This industry cannot be trusted to police themselves. Now the Liberals will be part of the crimes NOT the solution to stop the cruelties. Lifeforce, a Vancouver-based ecology and animal rights organization, was invited to participate in the BC Sled Dog Industry Task Force review. Lifeforce submitted our Draft report entitled, “The Case Against Sled Dog Industries” See that recommends a total BAN of sled dog tourism and racing. Animal rights groups in British Columbia are alarmed by new guidelines — sparked by an ugly sled-dog slaughter — that contain instructions on how to humanely shoot a dog. Whistler Sled Dog Massacre: No Criminal Charges To Date! In April 2010, there was a reported slaughter of 100 dogs by Bob Fawcett who was working with Outdoor Adventures. The murders were discovered when he tried to get government compensation for distress. The board case manager reported that 100 dogs were put down "due to a slow winter season." A government document: had to perform what he described as execution-style killings, where he wrestled the dogs to the ground and stood on them with one foot to shoot them ...he grazed an uncooperative male, taking off part of its head.... had to kill the dog with his knife, by slitting its throat while the dog was on top of him... in some cases, it was easier to get behind the dogs and slit their throats and let them bleed out. Please the full Petition:Stop Whistler Sled Dog Abuse Industry! STOP WHISTLER SLED DOG CRUELTY INDUSTRY! The Vancouver Aquarium not only secretly moved their last male beluga, “Imaq”, BUT has quietly pushed through a controversial new expansion proposal. Why was the beluga moved without advising the media? Was the beluga in bad shape from the 3 year confinement and the bullying by another in a hidden back pool? Will the Vancouver Aquarium provide the Health Certificate? Lifeforce will be investigating. This year the world wide events will be held from April 16th to April 25th. Lifeforce has prepared background information, posters, post card and more to help the numerous events. 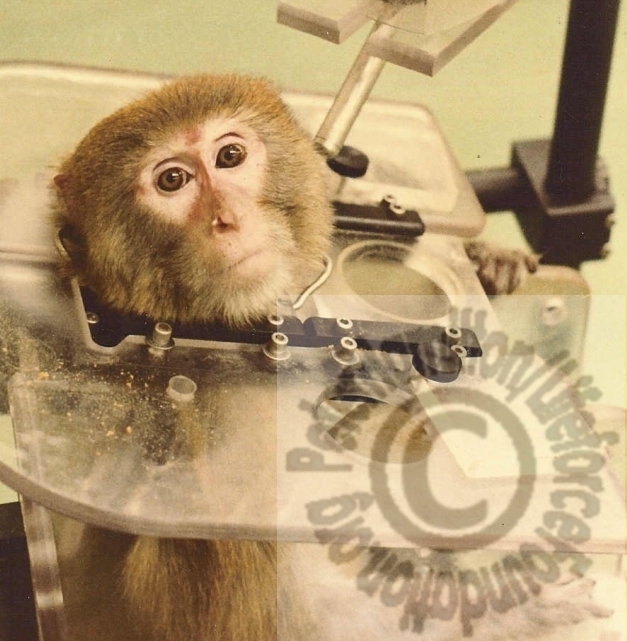 Lifeforce has updated our Broken Promises brochure about spinal cord experiments on animals. It has been 25 years since Lifeforce investigated these experiments and the experiments continue today by the same vivisectors and others. We also include an update about Rick Hansen’s 25th anniversary of trying to find a cure for spinal cord injuries. This year the world wide events will be held from April 16th to Apriul 24th. Lifeforce has prepared background information, posters, post card and more to help the numerous events. Lifeforce, a Vancouver based ecology and animal rights organization, was formed in 1980 and is extremely excited about the growing vegan movement. As seen by international media exposure, the public is accepting vegan lifestyles. The unnecessary invasive experiments on older endangered turtles and the further imprisonment for the younger ones is a horrible plan. If the oldest turtle is 72 years at Sea Life Centres and if green sea turtles can live up to 100 years (and sea turtle longevity records is 152 years > Guinesss Records) then none of the turtles are on deaths’ doorstep. They should die in peace and not be subjected to painful, unnecessary experiments. Recently, it was revealed by a whistleblower that UBC experiments have been conducted for over ten years with endangered green sea turtles. It was claimed that the remaining turtles would be killed because the lab will be demolished. UBC said experiments were started to study climate change and fishing methods since one of the threats is entrapment in fish nets. These 16 green sea turtles were obtained from the Cayman Islands Turtle Farm. Two died, and seven were retired to educational facilities. But now the remaining seven turtles are scheduled to be killed this spring. Bill Milsom, researcher and head of UBC’s zoology department, claims that major surgeries must be done to complete a study of diving depths. In the wild, sea turtles continue to dive to depths already known by observations from field studies. The massive fishing nets continue to intrude into their territories. Environmentalists have been fighting for fishing moratoriums and bans on destructive fishing operations. 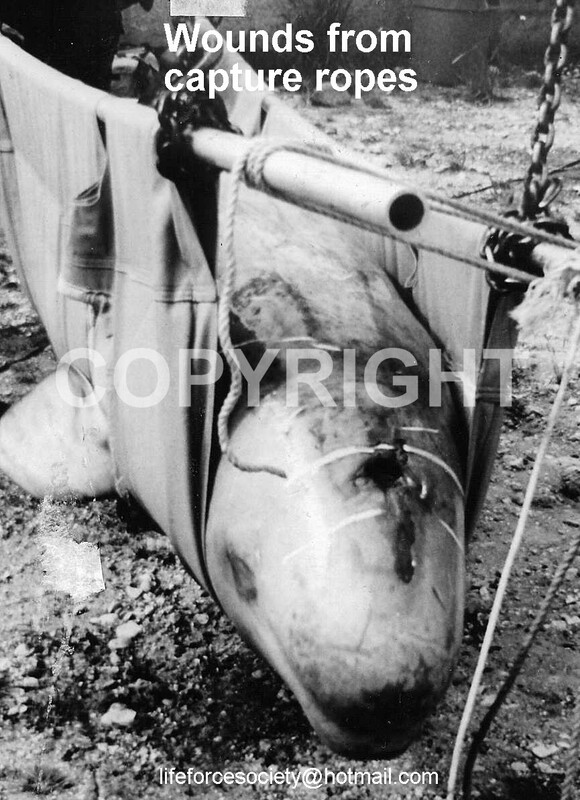 Sound deterrents have been tested on some fishing nets in attempts to prevent dolphin, porpoise, and whale entrapment. Some of the TEDs (Turtle Excluder Devices) and TSDs (Turtle Saving Devices) have been developed as far back as the 70s. 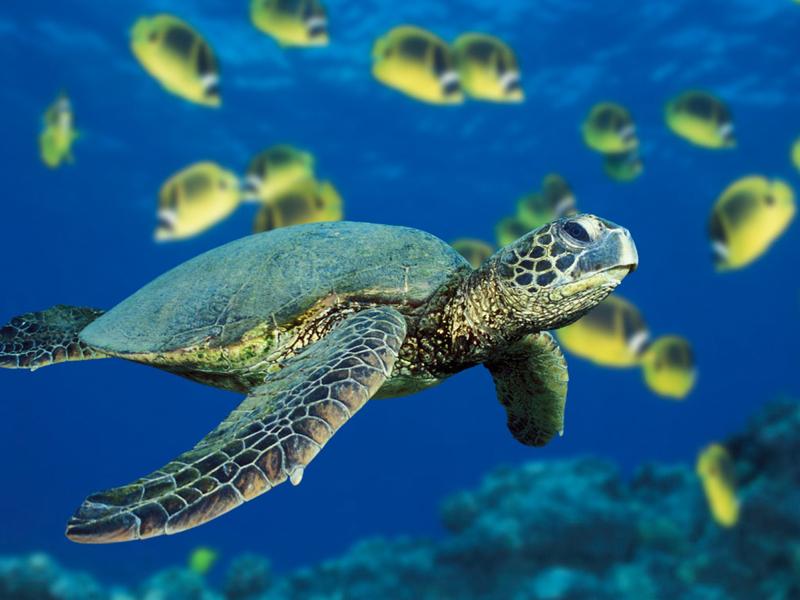 Also raising ethical concerns, in the wild dive depths and ranges of turtles have been determined by attaching data loggers and satellite tags to sea turtles and other marine wildlife. In fact, UBC has participated and are fully aware of these alternatives. Imprisoning sea turtles in laboratory chambers and tanks to look at thermoregulation, dive behaviour and heart rate will not save them or others. Harnessing them, starving them and subjecting them many other stressful, painful experimental procedures are extremely cruel, scientifically fallacious and absolutely unnecessary. One experiment conclusion was that summer and winter month activity of the turtles was the same. But of course that is under the artificial laboratory conditions. No breakthroughs here at UBC and certainly no justification for over ten years of experiments. UBC endangered sea turtles should die in peace not in experiments. Lifeforce, a Vancouver-based ecology and animal rights organization, was invited to be part of the BC Sled Dog Industry Task Force review. 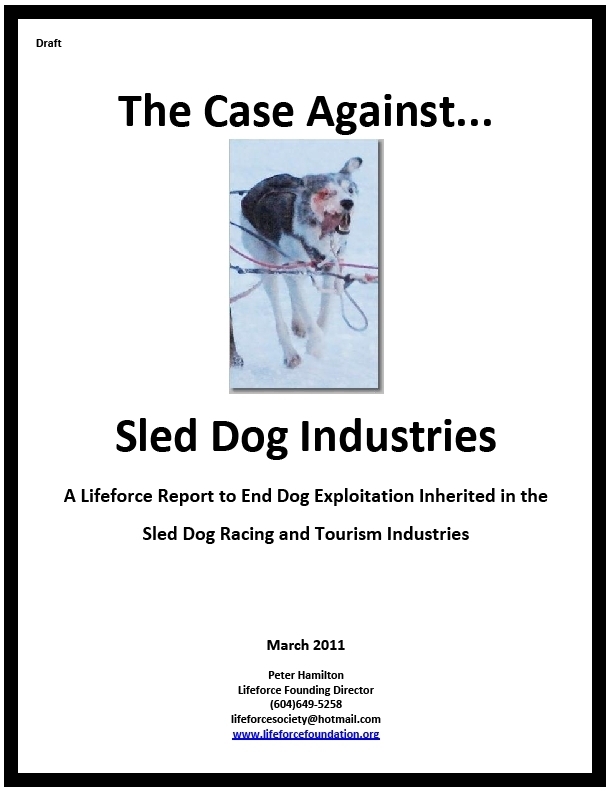 Lifeforce has recently submitted our Draft report entitled, “The Case Against Sled Dog Industries”. Please read the attachment. The history of the sled dog industries reveals that the reported inhumane slaughter of dogs in Whistler, BC was not an aberration. It is inherent in the sled dog racing and tourism industries. The Task Force heard that there have been many, many cruelty investigations and charges laid. There are thousands of dogs bred for this industry and you can’t find humane retirement homes for all the victims. Mushers treat dogs as commodities not as companions. There is no Canadian culture to preserve with sled dog breeders breeding huskies with greyhounds and other breeds in attempts to create faster breeds to win the lucrative prizes. Contrary to the claim by Task Force Head, Terry Lake, these dogs are not “doing what they're born to do". This sounds like the illegal dog fighters who claim that pit bulls were born to fight. Both claims are absurd and both are inherently cruel businesses that cannot be condoned. A compassionate society should not license cruelty. As stated in our report any regulations will not eliminate the abuses in the racing and tourism industries. In addition, any enforcement is not possible in many cases. People can choose to race themselves under grueling circumstances and stop the exploitation of dogs. Racers and tourism businesses must put on their skis, ride snowmobiles or run all terrain vehicles (ATVs). People can enjoy Super Natural BC without animal exploitation. The plight of these dogs must end! HELP BAN SLED DOG INDUSTRIES! The Task Force Report will be released on March 25th. Although the Government's deadline has passed the public concerns about abusive sled dog tourism and racing industries is not dead. Lifeforce urges all to continue to email the task force. Email your polite letters to the BC Sled Dog Industry Task Force, (MLA Dr. Terry Lake, Kamloops-North Thompson; Craig Daniell, Chief Executive Officer, the BC Society for the Prevention of Cruelty to Animals; and Barbara Steele, President, Union of British Columbia Municipality). Sled dog task force report may come in two parts. 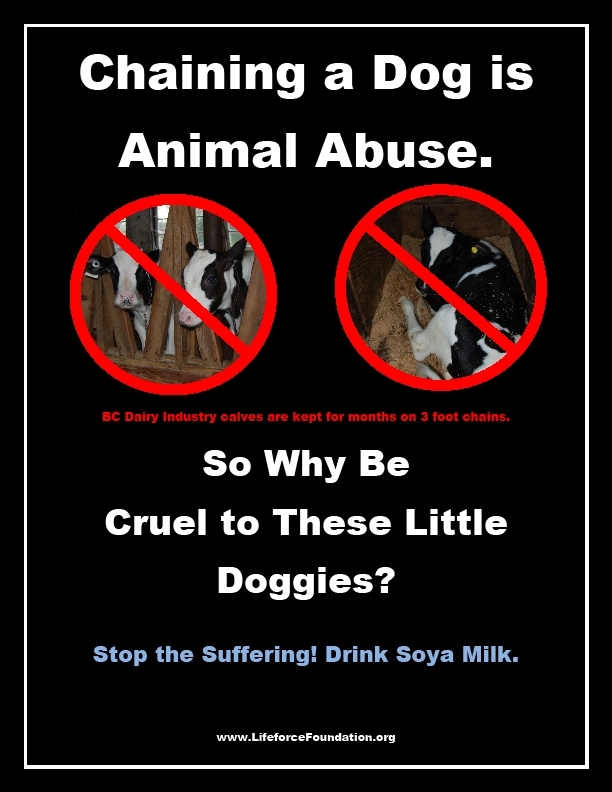 Head of Task Force said: “... they understand the desire of the public to correct any problems within the industry and make sure that these animals are well cared for — that the industry conforms to a level of social responsibility that British Columbians would expect from them.” He made similar opinions previously claiming that the industry can be improved and dogs won’t continue to suffer. WRONG! IT MUST BE BANNED! 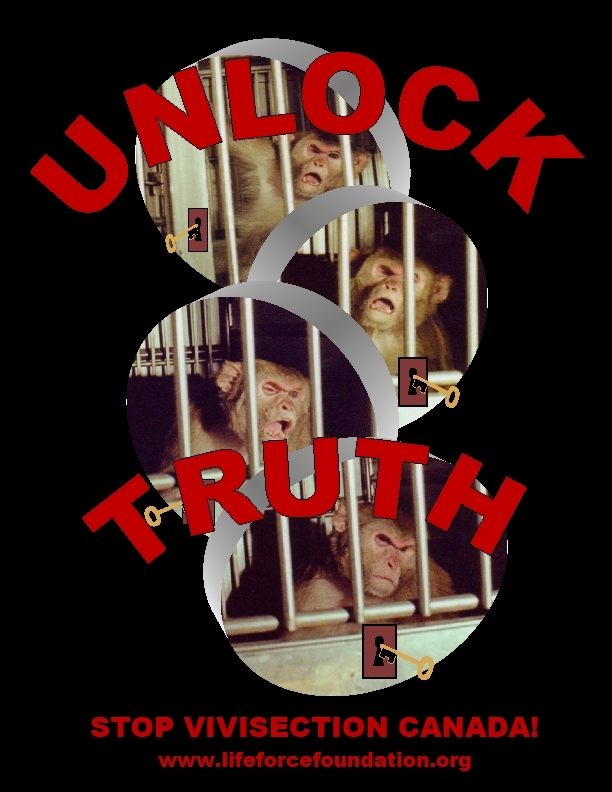 The new Stop Air Canada Monkey Trafficking Facebook is part of Lifeforce's campaigns to expose the harm to people and animals caused by vivisection. The use of “animal models” is both cruel and scientifically fallacious. 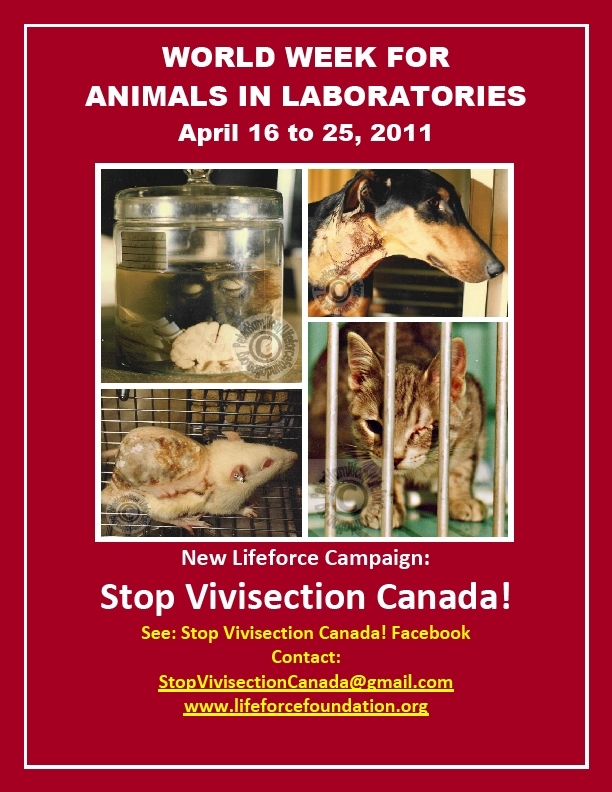 In order to phase out vivisection in Canada Lifeforce launched the Stop Vivisection Canada! campaign in 2010. We are urging people to send our online postcard to politicians. Canadians email it to their MPs and others mail it to the Prime Minister. Recently the Vancouver Courier published a story about animal experiments at the University of British Columbia. 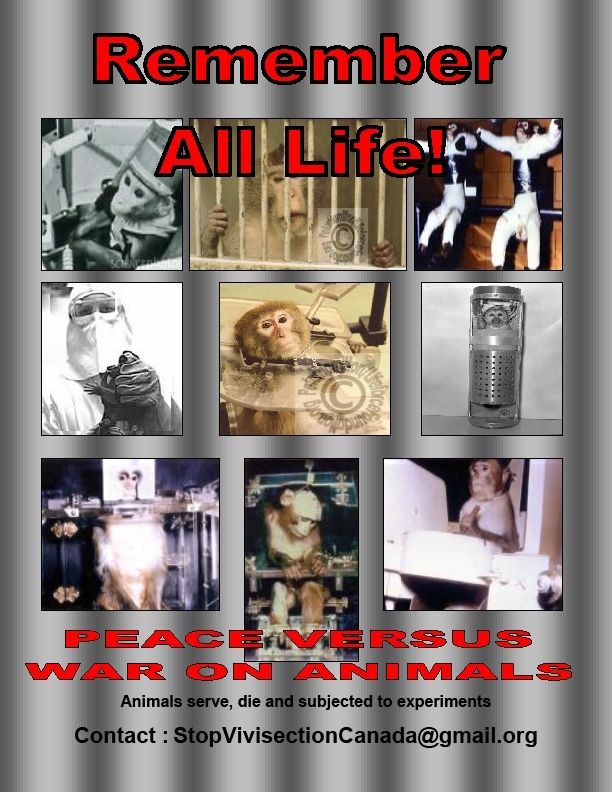 The article criticized those who opposed vivisection for many of the same old excuses that I have heard over the years. I sent information to clarify the how the research system actually works and why animal models are scientifically fallacious. The paper asked to publish my summary of the issues. I hope that it will help clarify the issues for those who have been brainwashed by the multi-billion dollar vivisection industry. Is there a plot to overthrow the Chinese government by selling seal meat? The “edible” seals are major human health risks. 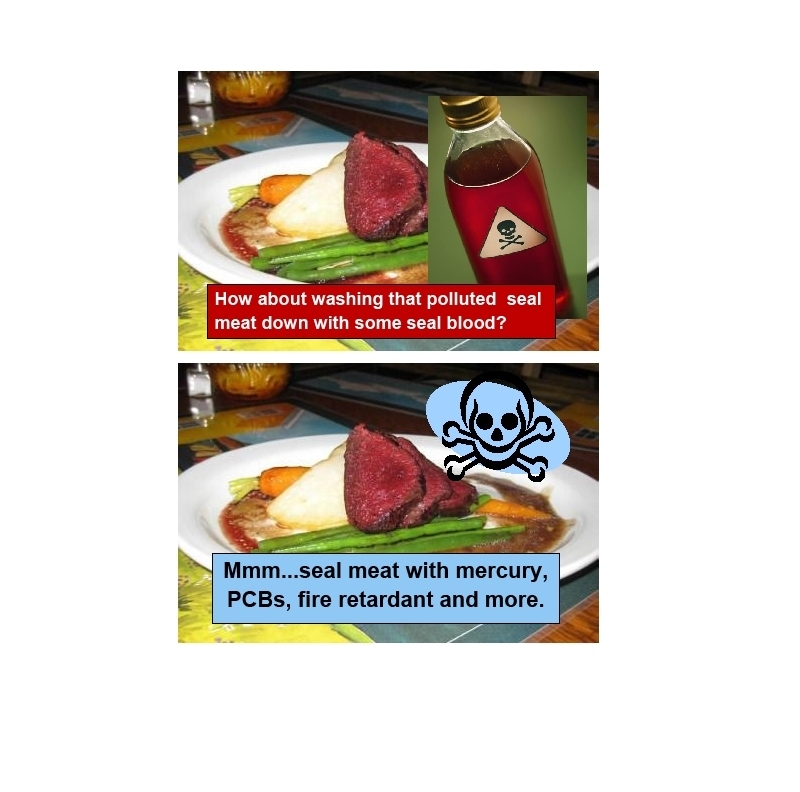 Studies show that marine mammals are highly contaminated with mercury, PCBs, fire retardants and other pollutants. A DFO report had stated that a West Coast seal slaughter could not recommend eating seals since they are full of toxic chemicals. They said that only baby seals may be safer to eat since older seals had greater exposure to environmental pollution. So are babies and adults on the menu? Are they served with both an Ethical and Health Warning? The Vancouver-based ecology organization, Lifeforce, has been asking politicians to promote eating healthy by supplying more vegetarian and vegan items on menus in public/government facilities. You can reduce the animal suffering, health hazards, and Global Warming by promoting eating non-dairy and non-meat products - a vegan diet. The intensive production of animals for dairy and meat contribute up to 51% of Global Warming as compared to the more publicized transportation issue that is a 13% factor. We must reduce and phase out the 60 billion animals who are killed every year worldwide. People can protect their own health, stop animal suffering and stop environmental degradation. It is scientifically proven that meat is a risk factor for many diseases such as cancer, heart, and diabetes. These illnesses are the most frequent cause for illnesses and death in humans. This represents a growing financial burden for health care services too. There is a wonderful selection of vegetarian/vegan products on the market. The more we eat the more we will protect people, animals and the environment. Lifeforce Letter in Beijing Today.